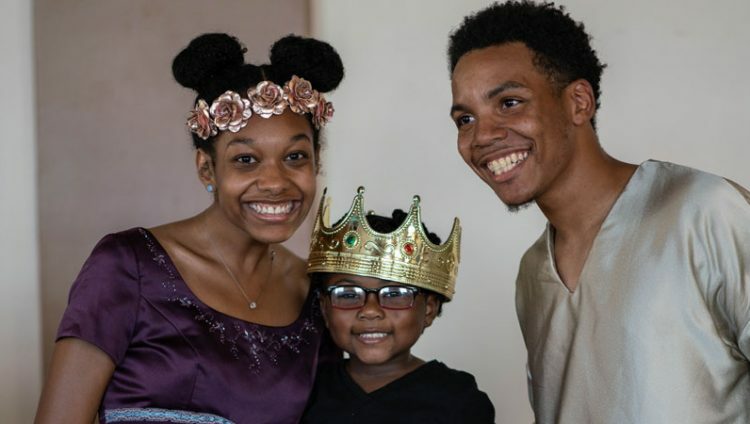 ANN ARBOR—Black and Brown Theatre will partner with the Ann Arbor District Library Westgate Branch to present Cloud Spinner, a new live fairytale stage play for young audiences and their families that encourages children to protect the environment in their own lives. Cloud Spinner performs at the Ann Arbor District Library Westgate Branch: 2503 Jackson Ave, Ann Arbor, MI 48103 (inside the Westgate Shopping Center) on Earth Day, Monday, April 22, 2019 at 4:00pm. Seating is first-come first-serve so early arrival is encouraged. Recommended ages for young audiences are 5-8 years old. The performance runs about 30 minutes and the talk-back runs about 10 minutes. The play uses larger-than-life fairytale characters that both children and adults will love and also includes a powerful message of not taking “more than what we need”. In the play, a young boy named Michael has an extraordinary skill of spinning clouds into scarves to protect villagers from the heat. When Michael meets the town royals, they convince him to continue using the clouds to make scarves for fashion purposes. With the clouds disappearing at a rapid rate, the rain stops nourishing the crops and the heat grows unbearable until a smart young princess hatches a plan to save the town. Will Michael and the princess reverse the damages and make a change for the future?